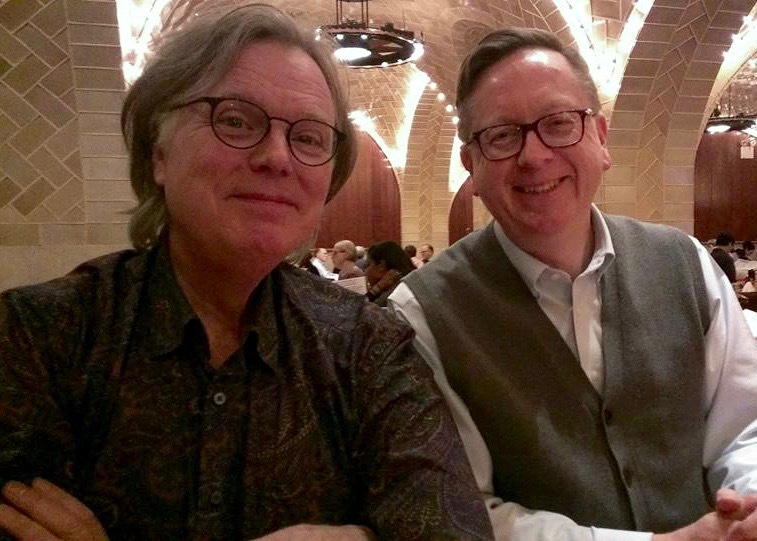 Steve Doyle and me at the Grand Central Oyster Bar a few years back. In this public story of The Private Life of Sherlock Holmes, I knew we would come to the 75th anniversary edition that I edited for Wessex Press. I am not too shy to say that I was (and still am) rather proud of how it all came out. The mere fact that I had a role in keeping the book alive and available for a new generation was an honor indeed. Readers have been very generous in their response and the book sold out after just a few years. That all was to the good. The problem is that I feel far too intimately associated with the project to stand back and talk about it. So I asked myself who would know how it all came about and could effectively tell the tale? The answer was easy. I turned to Steve Doyle, a longtime friend and one half (with Mark Gagen) of the Wessex/Gasogene team, to let you know the back story. Gasogene Press (an imprint of Wessex Press) Indianapolis, IN, 2008. Hardcover. 7 7/8" X 5 5/8". Cover: Deep navy blue cloth over boards. THE PRIVATE LIFE OF/SHERLOCK HOLMES/VINCENT STARRETT/75th ANNIVERSARY/EDITION in gilt, with a stamped woodcut of Frederic Dorr Steele’s drawing of William Gillette as Holmes. Spine: THE/PRIVATE LIFE/OF/SHERLOCK/HOLMES; Line; STARRETT at head. GASOGENE BOOKS at tail. Dust Jacket: THE PRIVATE LIFE OF/SHERLOCK HOLMES at top of cover; By VINCENT STARRETT/75TH ANNIVERSARY EDITION/EDITED BY RAY BETZNER at bottom. Lettering in red on a tan background with most of the page taken up by D.H. Friston’s frontispiece from the first edition of A Study in Scarlet. Spine: THE/PRIVATE/LIFE/OF/SHERLOCK/HOLMES; STARRETT at head. GASOGENE BOOKS at tail. Front inside flap: THE PRIVATE LIFE/OF SHERLOCK/HOLMES by Vincent Starrett. Blurb describing the book, continued on back flap. Brief bios of Starrett and Betzner on back flap. Ray Betzner is, without doubt, the authority on the life and work of Vincent Starrett. 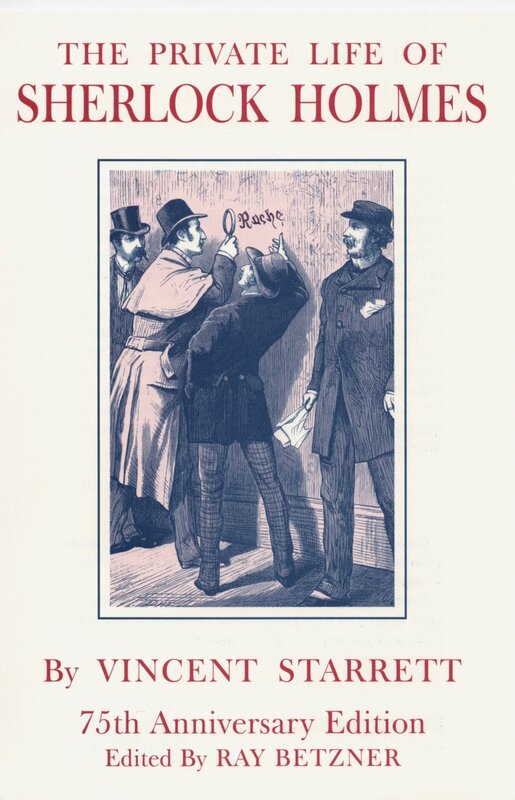 (My blushes Steve—Ray) With every installment of A Study in Starrett’s bibliographic history of The Private Live of Sherlock Holmes, Ray provides a new chapter in this book’s unique, definitive publication history. Thus it was with a bit of surprise that I received the invitation to author the chapter about one single link in this chain: The Private Live of Sherlock Holmes: 75th Anniversary Edition, edited by Ray and published by Wessex Press/Gasogene Books. I said I felt a bit surprised at the request but also, I confess, it was also received with happiness, as The Private Life of Sherlock Holmes was for me, whose Sherlockomania was born in that white-hot explosion of the mid-1970s, one of my foundational texts. As Ray described several chapters ago, it came about through a very specific edition—that Pinnacle paperback edition. It had me at the cover, the greatest cover illustration for any Sherlock Holmes book ever published, and the 14-year old me scouring the shelves of Walden’s Books at Scottsdale Mall was never the same. Private Life was the first book I read that played the game. 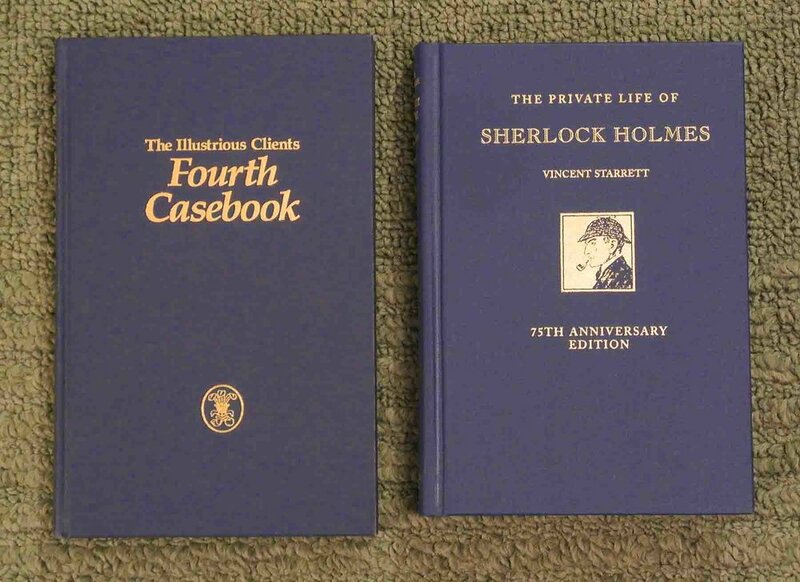 Compare the two covers of The Illustrious Clients Fourth Casebook and the 75th anniversary edition of Private Life. When Mark and I later founded Wessex Press, our unofficial motto became “Publishers of Books We Want to Read.” Very early on I had conceived the idea of not just doing a new edition of Private Life, but actually a new edition of the original first edition. In retrospect, I wonder if this was because at that time, before the easy accessibility of rare books on the internet, actually finding a first edition of Private Life, let alone being able to afford one, was very difficult. But I also as publisher always desire to publish something unique, what I think of as that “must have” volume. This is Ray’s inscribed copy of the 75th anniversary edition with good wishes from Steve Doyle and Mark Gagen. As we have read previously in this bibliography, there have been numerous editions by various publishers, but there wasn’t really what I would call a second edition of the the original edition, and that’s what I had in mind. However, if that was all it was to be, all we’d need do is reproduce the pages from the first edition, change the copyright page, and send it to the printer. No, that wasn’t quite right, and we coined a new term to describe our Private Life: a facsimile-plus. This meant a new edition of the first edition, with value-added editorial content reflecting the passage of time between then and now. As I said, we had the idea for this book quite early, but we sat on it for a long time. We knew that we would need to justify yet another edition of Private Life, which had somehow inexplicably fallen into the public domain, causing a flurry of cheap, poor quality editions to appear. It was sometime around the turn of the millennium that we realized the 75th anniversary of the book’s publication would be the perfect time to unveil a truly new, revised and updated version of the 1933 edition. In the meantime, we needed an author/editor to take it on. Ray Betzner immediately came to mind. I already knew Ray revered Starrett as I did. He had steered me to where I could find signed volumes and how to avoid the notoriously forged signed copies in circulation, and shared several memorable Starrett-themed conversations during BSI weekends. And so it was, in the cocktail hour before the BSI dinner in a year around 2005 or so, that I pitched the project. After a conversation or two over the course of the weekend, to our great relief he said yes. So, we had our project, we had our editor, and we had our publication date. Ray set out to produce the new content, and Mark Gagen and I turned our attention to the physical creation of the work. Since our plan was to literally create a new, near-facsimile of the 1933 edition, the first thing we had to do was scan the original book, which is a lot more difficult than it appears. While we had a copy of the 1933 edition, we weren't willing to cut out the pages to get flat, clean scans. So, each page was scanned as flat as we could get it, all 230 pages, at a very high-resolution…a very slow process. Then, each page was corrected for distortion created during the scanning process, and cleaned and retouched. For the new content, which appeared before and after the original content, we conducted a sort of forensic/typographic deconstruction of the original typesetting, determining not only what typeface it was, but the kerning, leading, and other characteristics in order to match as closely as possible the typesetting of the new material to the original. When the new content came in, we could see that this book was going to be special. This material included a new, illustrated introduction by Ray, telling the origin story of Private Life, as well as an illustrated and annotated bibliography of the various editions to date. 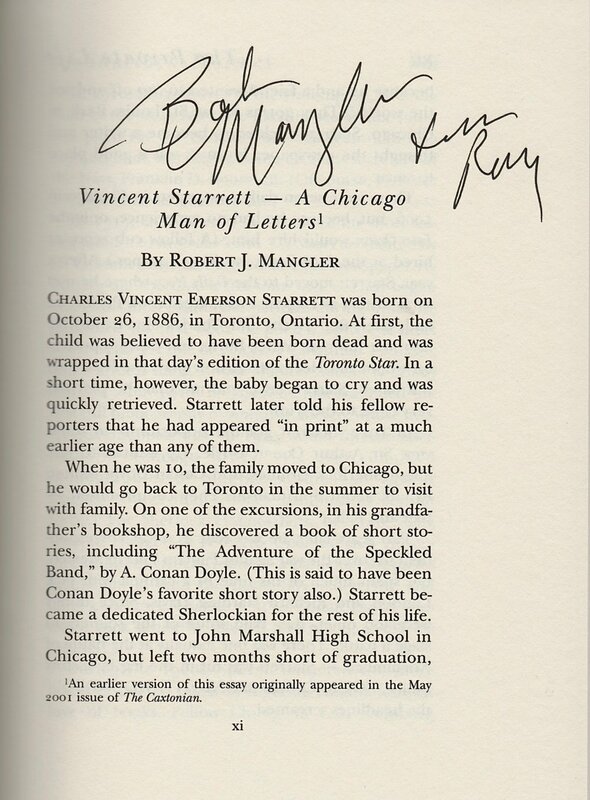 The late Robert Mangler, a friend of Starrett’s and long-time leader of The Hounds of the Baskerville (sic) signed Ray’s copy at at meeting of the Hounds. Should it be a slavishly reconstructed facsimile of the original, or an adaptation of the original cover? We opted for the latter, which is what we believe The Macmillan Company themselves might have done had they gone ahead and published this edition instead of us. We matched the cloth boards as closely as we could, emulated the gold stamping, and then created an adaptation of the original dust jacket. It was an exciting day when Mark Gagen called to say the books had arrived at the warehouse from the printer. Personally speaking, it was the culmination of an idea I had held in my imagination for well over a decade. We opened the carton of books…and there it was. It is always a thrill, even after all these years, to hold a new book in your hands for the first time, a book that physically didn’t exist until the combined efforts of your author and you bring it to life. It was a book we were all instantly proud of. The Private Life of Sherlock Holmes: 75th Anniversary Edition, edited by Ray Betzner was a Gasogene Books best-seller. It debuted in New York in the Dealers Room of the 2008 Baker Street Irregulars Birthday Weekend, and went on to ultimately sell out. It has been called by reviewers “the definitive edition” of Private Life, but most important of all involved with the project, we are convinced that Vincent Starrett himself — Starrett the author and bookman — would be pleased as well. A rare poster for the anniversary edition, signed by Steve and Mark. It was tacked up to the wall behind the sales table at the 2008 dealer’s room. I asked to have the poster, and Steve and Mark signed it. I now have it up in my office at work and see it each day. It provokes very good memories. Let me tack on a few notes about the text. I wanted a biographical essay on Starrett for the 75th anniversary edition and was able to get one from his old friend, the late Bob Mangler. Years earlier, Bob had written an appreciative biographical essay of Starrett for The Caxtonian newsletter, published by the Caxton Club in Chicago. Bob agreed to a number of minor revisions and The Caxtonian graciously gave their permission to use the piece. There needed to be an introductory essay too, one that set the book into its historical context. I took that on. Long-time friend and editor extraordinaire David Morrill reviewed the new content for the 75th anniversary edition, and I once again say thanks. Finally, I can’t say enough about the dedication of Steve and Mark. It would have been easy to produce an inexpensive edition that failed to echo the original. Their total commitment to the project resulted in a work I remain proud to be associated with to this day. They also had more confidence in me than I had in myself. Thanks guys. Of all the articles and books I’ve been involved with over the years, this one stands at the top. By all rights we should be done with this telling of the Private Life story, but there are some bits and pieces that deserve to be told before we can call it a wrap. Stay tuned.